Anterior Tibial Artery is an important artery of the anterior compartment of the leg. It is corresponding to the posterior interosseous artery of the forearm. 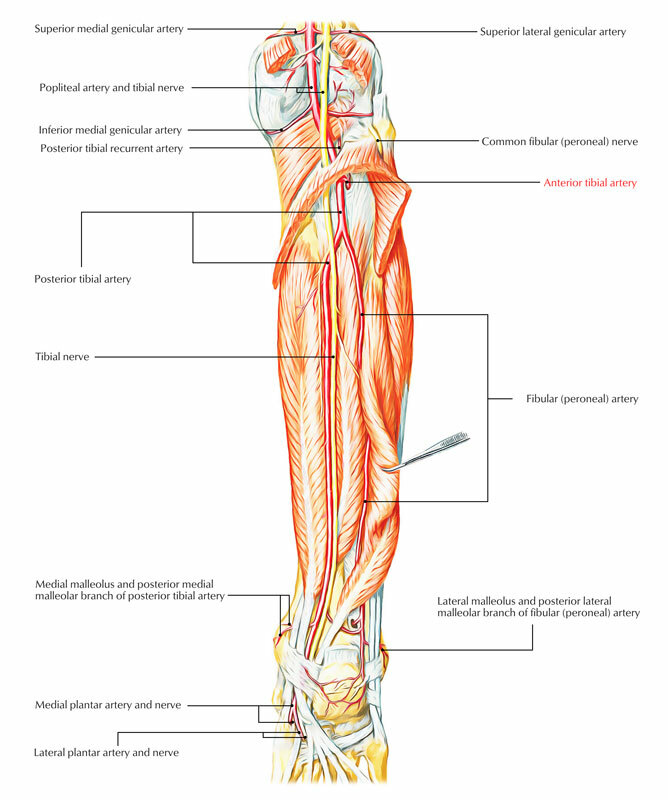 The blood supply to the anterior compartment of the leg is bolstered by the perforating branch of peroneal artery. Hence, the size of peroneal artery is inversely proportional to that of the anterior tibial artery. The anterior tibial artery is accompanied by 2 venae comitantes. Anterior tibial artery is the smaller terminal branch of popliteal artery given at the lower border of popliteus muscle. It commences in the rear of the leg at the lower border of popliteus. It enters the anterior compartment of the leg by passing forward between both heads of the tibialis posterior, via an opening in the upper part of the interosseous membrane. In the anterior compartment, it runs vertically downward to a point midway between the medial and lateral malleoli, where it enters the foot and changes its name to dorsalis pedis artery, which finishes near the internet between the big and 2nd toes. 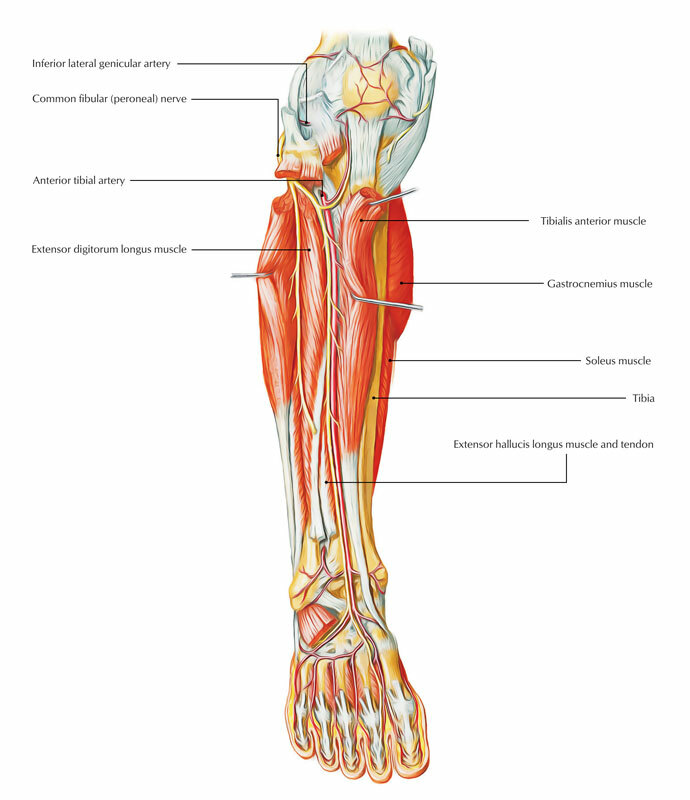 In the upper 1/3rd of the leg it is located between the tibialis anterior and extensor digitorum longus. In the middle 1/3rd of the leg it is located between the tibialis anterior and extensor hallucis longus. In the lower 1/3rd of the leg it is located between extensor hallucis longus and extensor digitorum longus. It’s crossed from the lateral to medial side by the tendon of extensor hallucis longus. Because of this, the deep peroneal nerve is located lateral to it in its upper 1-third and lower 1/3rd and anterior to it in its middle 1/3rd. Anterior and posterior tibial recurrent arteries: They take part in the arterial anastomosis around the knee joint. Muscular branches to adjacent muscles. Anterior medial and anterior lateral malleolar arteries: They take part in the anastomosis around the ankle joint. Variations of the anterior tibial artery: The anterior tibial artery may neglect to grow more when compared to a short way down the leg. In such cases, the dorsalis pedis artery originates from the perforating branch of the peroneal artery or perforating branch of the posterior tibial artery.